Following are excerpts of an article featuring this family that was printed in The Kokomo Perspective by Lisa Fipps in December 2008. Look closely at a butterfly's wings and you'll see that they are covered in scales, just like Cora and Selia. The two, now 5 and 3, were born with a rare genetic disorder: lamellar ichthyosis. Cora and Selia produce too many skin cells and/or their bodies can't shed them quickly enough, leaving a scaly buildup. Whereas many people refer to them as fish scales (the root of the word ichthyosis comes from the Greek word for fish), this family, and others dealing with the disorder prefer to liken the scales to those found on butterflies. "A butterfly has scales, but you don't see them unless you look closely," said Mark, Cora's and Selia's dad. "So the whole concept behind butterflies being a symbol for ichthyosis is that the children with it, the people with it, are beautiful creatures, but if you look at them closely, yes, you will see the flaws." "But they're still beautiful creatures," said Cora's and Selia's mom, Suzanne. Cora and Selia are like butterflies in one other way. Each girl was a collodion baby, born encased in a shiny, tight, skin membrane; picture a butterfly emerging from a clear, shiny chrysalis. When Cora was born a collodion baby, that was the first time the family knew she was different. "Dr. Steven Hott delivered Cora, and he and the nurses knew right away that something was wrong," said Suzanne. "It looked like she was wrapped in Saran Wrap." "I followed Cora down to the nursery, and I saw Dr. Hott looking through medical books to figure it out because he had absolutely no idea what was wrong," Mark said. "It was very scary, the fear of the unknown," Suzanne said. Later that day, Dr. Jack Higgins happened to see Cora in the nursery. He instantly knew she had ichthyosis. He'd seen a collodion baby one other time in his 30-year career. Dr. Higgins called Riley Hospital, and a doctor there told St. Joseph Hospital staffers how to care for Cora until she could be transferred to the facility in Indianapolis. Cora's skin had to stay lubricated, and she needed a humidifier, in essence, as she lay in her isolette. 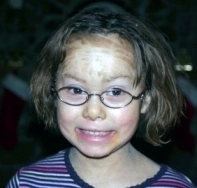 Once the family had the diagnosis, Suzanne called her friend who is a genetic counselor, Melissa Wesson, and she was able to tell the family all about ichthyosis. "It's an autosomal recessive disorder," Suzanne said. "So both of us had to have the TGMI gene. Mark and I are carriers, but we just didn't know it." 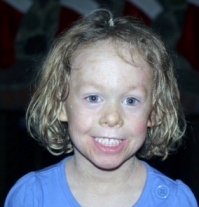 Although ichthyosis can be passed down from parents, according to the Mayo Clinic, "In some rare cases, the genetic mutation occurs spontaneously in the affected generation." "We didn't know it, but each time I was pregnant, we had a 1 in 4 chance that we would have a child with lamellar ichthyosis," Suzanne said. Before Cora, Suzanne had given birth to Gabrielle, now 10, and Kendall, now 7. Neither has ichthyosis. When Cora was 2 and Suzanne got pregnant again, the doctors offered to do testing to see if the baby, Selia, had ichthyosis. "We thought, 'Why?" Suzanne said of testing the fetus. "We already know how to handle it." Later in life, the four girls will have to decide if they want to be tested for the TGM1 gene, the family said. Caring for ichthyosis is very labor-intensive. It means spending hours bathing to loosen the scales, scrubbing the skin in an effort to shed some of the scales, and putting on creams to help moisturize and exfoliate. Someone with darker pigment has darker scales. Mark and Suzanne said that because Cora has dark hair and eyes her scales are more noticeable than Selia's. Dealing with the scales on the scalp is difficult, they said. It helps to cover the scalp in mineral oil, wrap Saran Wrap around it, and cover it with a hat for a few hours to loosen the scales. Then it's time to wash the hair and comb it. The problem is that often the comb will catch on scales that aren't loose enough to come off, causing pain. Severe scaling on the scalp can lead to patchy hair loss. Suzanne said many adults with it end up wearing wigs. Cora and Selia go to the eye doctor every three months to deal with dry eyes and skin buildup in the eyes. The tight skin makes it difficult for them to shut their eyes sometimes. Mark and Suzanne put Vaseline around their daughters' eyes at night so they close their eyes more easily. Still, they often sleep with open eyes. "It's pretty creepy, really," Mark said. "You walk in and you think, 'Are they looking at me or are they asleep?' " he said and laughed. The two sisters also see an otolaryngologist, who removes the excess skin built up in their ears. It can cause hearing problems. Both girls have speech problems that their parents attribute to them not being able to hear sounds well because of the ichthyosis. Cora and Selia, along with their older sisters Gabrielle and Kendall, attend a private, Christian school, Redeemer Lutheran School, where Suzanne teaches. "There, people accept them as who they are," Mark said. "Out in the real world, it's totally different." People stare. People point. People laugh. "Honestly, it makes me more uncomfortable than it does any of them," Mark said of his wife and four daughters. "To me, that's my child they're staring at, making fun of, and I wish that they would come up to me and say, 'What's wrong with your child?' I would answer every question imaginable if they would just come up and ask me. It's not the kids who are the worst offenders. It's the adults. I can understand kids being curious and not knowing. It's a fact of life, I guess. I guess I get mad. I don't get physically mad at them, but inside I get mad because I guess I wouldn't do that. Since I feel that I wouldn't do that, they shouldn't do that. Then again, I may be taking it the wrong way and it's an opportunity for me to come out and say, 'Hey, this is my child, and this is what she has.' We get comments all the time from people. God love them. They'll say, 'Oh, she's really sunburned, isn't she? Don't you think she's been out in the sun too long?' Then I have to explain, no, that's not what it is, and we have to talk about it. It makes me mad." "It doesn't make me mad," Suzanne said. "If people stare, I just kind of smile, then if they ask, I just answer them. If they don't ask, then we just go on. I just try not to make a big deal out of it." The older girls who don't have ichthyosis, Gabrielle and Kendall, struggle, too, because they don't know what to say or do when people stare or make rude comments about their sisters. "That's where the sisters kind of have issues a little bit because they feel like they have to defend them," Suzanne said. "People ask questions and look, probably look more than ask, and the sisters are starting to notice that a little bit more, the older they get, and that makes them a little uncomfortable. Gabrielle, she knows she should defend her sisters, but she's not quite sure how to handle it. You can't blame her. It's hard for a grownup to know how to handle something like that." But 5-year-old Cora is always willing to speak up when people stare or laugh. "I tell them God made me this way," Cora said. "And I like it because my skin is different than everybody else's that I see--and I get to take longer baths."